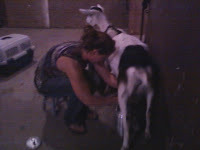 A journal about a Wisconsin girl starting a small dairy goat herd to produce, package and promote organic goat milk soap. Mostly musings about the comical and beloved animals we once kept in the city limits, under the radar. We have since moved them to our new farm, the OC Acres, in Beloit, Wisconsin. Information about our soap and lip balms can be found at www.opiesgoats.com. 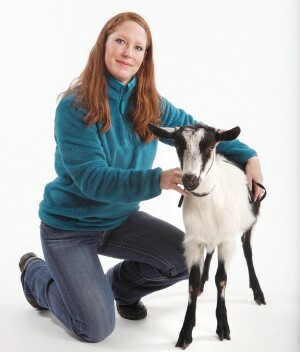 We recently had a journalist and a photographer visit us at the farm to discuss Opie's Goats, the product and the herd. Here is the resulting article from Monday, December 27, 2010. Last Tuesday I took little Louise to Madison to host a press conference with the Department of Agriculture and Alice in Dairyland at Community Pharmacy on State Street. Though the press attendance was thin, the press release for the even resulted in a lot of interviews with journalists who could not attend. This was the second, held immediately after the press conference at the Capital Times. I never intend to neglect this blog. It just happens. Don't feel bad. I neglect the website, my yard, housekeeping...you get the picture. I just keep getting busier and busier and some days I spend prioritizing my priorities. The goats got to get away from the farm with a little vacation at the Rock County 4-H Fair. Megan and Adam Vincent were the youth exhibitors and earned blue and red ribbons in breed and showmanship classes. I was beyond proud! We added a new goat to our microherd. Maggie joined us right after the 4-H Fair a couple of weeks ago. She is an Oberhasli, a Swiss Alpine breed just slightly smaller than the French Alpines she now rooms with out at Gehrig Game Farm. The girls also have a new pasture that they share with Tia Maria, a gorgeous Welsh cross pony, and a few stray chickens that wander over, possibly thinking the grass is greener, but who knows! I keep finding their eggs on the straw and hay beds. Clearly they are confused. That's all the time I have for now as I have soap to produce, package and promote! 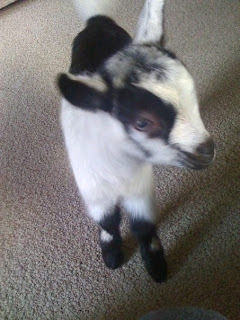 Well, we were blessed with our first doeling in 2010, Opie's Goats Sunny Louise. Symphony was due on March 9th and I had spent Sunday, Monday and Tuesdays nights keeping vigil, waiting not very patiently for an unknown number of kids to be born. I knew around noon last Wednesday, March 10 that Symphony was well into labor. She laid down, got up, laid down for hours, unable to get comfortable. I let her companion doe, Little Peanut outside and got a bucket of warm water ready and threw towels into the drier to heat them up. My dear friend and partner in crime, Crystal, coached from a few feet away and was quick to bring me the above mentioned supplies when I super-stressed out screamed to get them. The sun came out at just the time I was warming the baby goat, thus the name Sunny Louise. We've been enjoying her company ever since, letting her run around the house with the dogs, bottle feeding her and watching her climb stairs and jump on furniture. They are athletic little creatures! My guerilla marketing in New York City paid off. Matt Lauer did a wonderul plug for Opie's Goats Organic Goat Milk Soap. Last Tuesday morning, Gail (my mother) and I left our hotel room and took a taxi to 30 Rockefeller Center. 30 Rock. Still dark out, we hit Dean and Deluca for coffee and a muffin. People were already starting to gather outside The Today Show studio, having already gone through mild security and kept at bay with the famous barricades seen every morning on national television. Shortly after the show starts we are told that the talent would be venturing outside at 8 a.m. and 8:30 a.m. and added that Sharon Osbourne would be Kathie Lee's cohost in the later portion of the program. Hoda was on vacation or something. Anyhow, true to their word, the crew all came out at 8 a.m. and immediately greeted the crowd. Instead of shaking Matt's hand, Gail put a bar of Opie's Goats into Matt Lauer's hand. Walking away, he began to read the label and turned and said, "tell me more, what is Opie, who is Opie, etc." I said, "that's our last name. We raise French Alpine Goats and make soap out of their milk." He returned to stand next to Meredith, and when the cameras went live Matt said, "Meredith, these ladies wanted me to give this to you. It's Opie's Goats Soap." She looked at the bar, smelled it, and said, "smells good!" And that was our Today Show plug! Just like that. Contrary to popular belief and as a result of very successful marketing, soy is not man's best friend. Not in the least. In fact, soy can be quite toxic especially when it isn't fermented (I think tofu is a fermented product). Nonetheless, soy has always been presented as a health food, with advertisements boasting about how soy is the cornerstone of healthy Asians. The fact is, Asians eat very little soy. That said, I will be buying soy free feed for my goats. Goats, like humans, are not built to digest soy without negative side effects!